We are pleased to reprint this article on Mexican opal, by David Gibson, a British collector. It comes from his website, Mexican Amber. The article is © David Gibson, and is used by permission. Dave Gibson at Miguel’s mine. Opal was known to the Aztecs by the name Vitzitziltecpa, which means hummingbird stone, due to its similarity to the bright iridescent colours of the bird’s plumage. The original mining locations were lost during the Spanish conquest. They were rediscovered sometime in the early 1800s, by Sir Maria Siurab, in the state of Querétaro, some 130 miles northwest of the Mexico City. The first mine was Santa Maria del Iris. 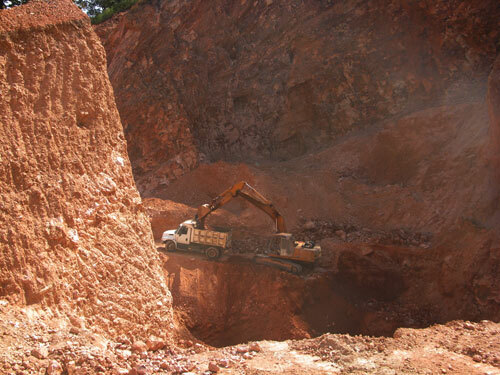 Soon other mines were opened: La Carbonera, La Hacienda, La Trinidad, and El Perido being but a few of the first mines. The colonial City of Querétaro became center of the Mexican opal trade. In the late 1950s Alfonso Ramirez of Querétaro discovered opal near the small town of Magdalena about 50 miles northwest of Guadalajara in the state of Jalisco. 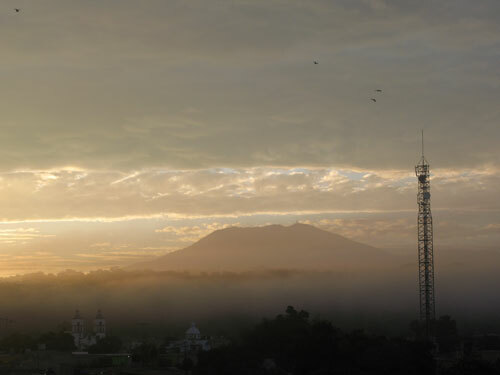 He opened the first mine, La Única, close to the Tequila Volcano. 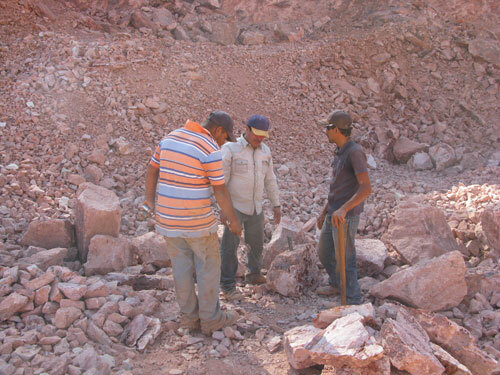 Soon after, prospectors and miners moved from Querétaro to Magdalena. 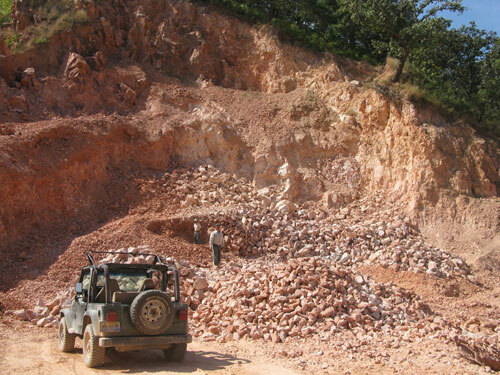 Other deposits were discovered in the municipality of Magdalena (Las Latillas, La Mora, San Simón, Las Cruces, San Martín, El Huaxical and El Cabon being but a few of the early mines. By 1960 there were hundreds of mines around the small town of Magdalena. From the early 1960s to the late 1970s much opal was produced by the mines in the state of Querétaro and the Magdalena area. Nowhere as much mining takes place now. It seems the best deposits were discovered back then and mined out. 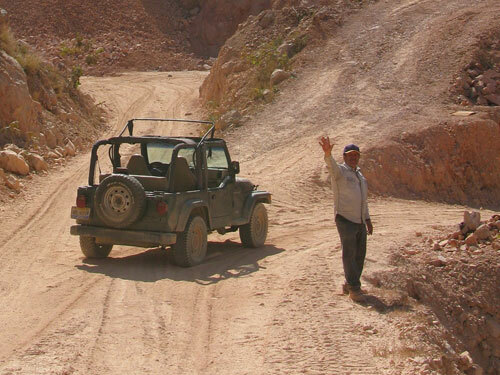 Welcome to Pata de Gallo mine. I remember back in the 1970s many vendors of opal in the plazas in Querétaro and the plaza of Magdalena especially at the weekend when the miners would come into town. 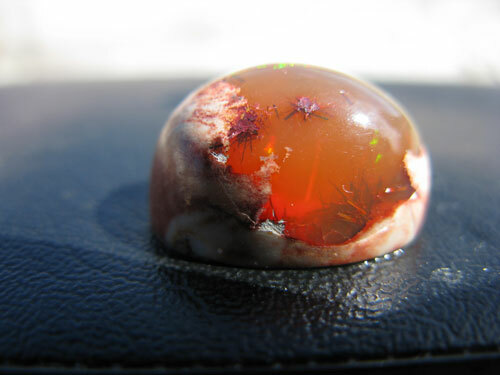 Back then the orange-to-red opal with no play of colour was generally known as Cherry opal. It was cut en cabochon and given to the women and children to get what they could for it. It was possible to sit in the plaza and buy quite a few of these stones for just one dollar. Of course they are now almost always faceted and known as fire opal—good marketing! Mexican opal has always been much appreciated by the Germans and Japanese. 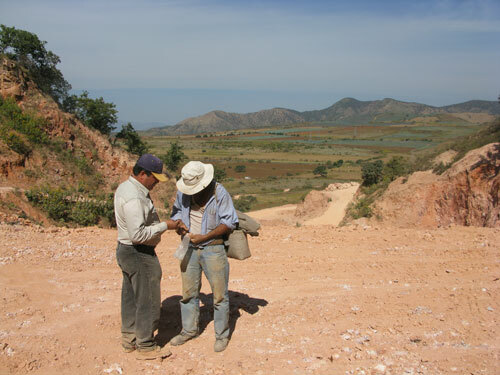 In 1969 Shdao Machizuki of Japan bought the San Simón mine, which is a few miles north of Magdalena. He did much to help the people in the tiny pueblo of San Simón and improved mining methods. Shdao is now retired, but the mine is now run by his son Satoshi. The mining is open cast. 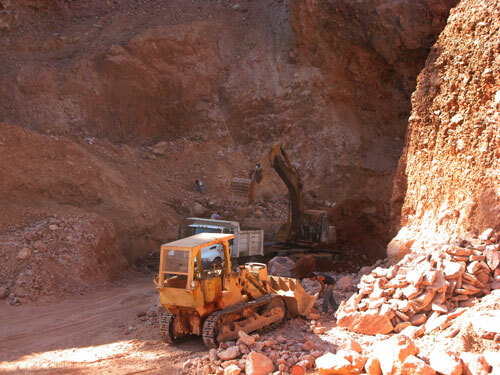 The pictures above and below are of the Pata de Gallo mine, a few miles northwest of Magdalena. It is owned and operated by Miguel Tomayo. It is an open cast mine which uses a bulldozer and a backhoe. A small charge of dynamite is often used to break up the rhyolite rock. The opal is in pockets and seams in the rock. Opal mining is a risky business. With the cost of buying and operating the heavy equipment, and paying the miners, one can very soon go bust if opal is not found. Discussing if a rock contains opal. It will be split open with a hammer and chisel. I do know that Miguel has good knowledge on opal and mining. Even so, in my day at the mine the only opal I saw was from a freelance fossicker going over the dumps of rejected rhyolite rock. Always buy opal from a reliable source. 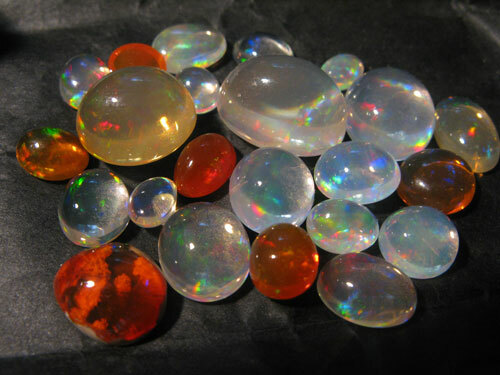 Ask if the stone has been kept dry, most opal contains 3–10% water—though it can be as high as 20% or more. It is the drying out of the stone’s water content that causes it to craze and crack. If the stone has been dry for 12 months or more it should be stable. Miguel examining opal from a freelance fossicker. Rolling flash: Color flashes that appear as the stone is turned. Matrix opal containing goethite needles. 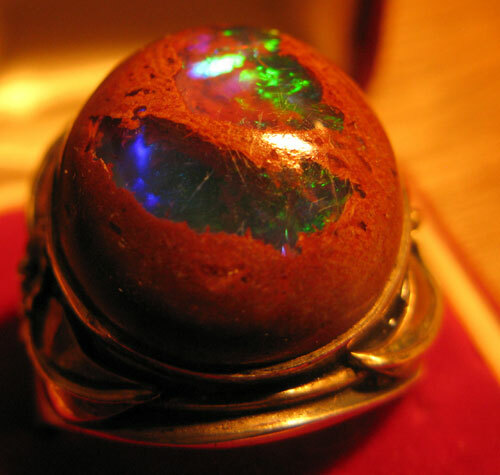 Matrix opal with full spectrum of rolling flash. Mexican opal often has inclusions of goethite-like needles, sometimes wrapped in limonite. Hematite crystals and botryoidal inclusions of white chalcedony. The inclusions often create amazing scenes when under magnification. Dr Edward Gübelin has taken some amazing photos of inclusions in Mexican opal. 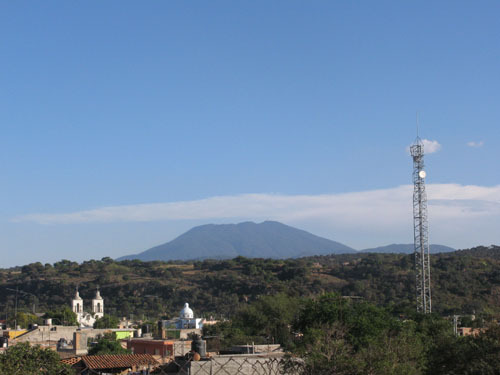 View of Tequila Volcano from Hotel el Ópalo. 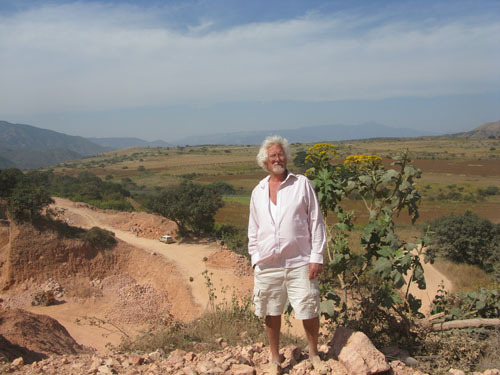 For anyone wishing to visit the opal mines, Querétaro is a nice place to stay. It is a Spanish Colonial city with lots of pleasant plazas. The center of the city is a UNESCO World Heritage Site. In Magdalena the Hotel el Ópalo, just off the plaza behind the church, is a good place to stay. The owner Gonzalo Bonuelos has a good knowledge of Mexican opal. He is also a vendor of Mexican opal.